Gourmet Hand-Tossed New York-Style Pizza - From The Bowling Alley Concession Stand? Gourmet hand-tossed pizza, crafted with the finest ingredients and topped off with the likes of fresh seasoned tomatoes, herbs and real cheeses, has become all the rage in many fine eating establishments. Such pizza has not, however, been generally available from concession stands, bars, amusement parks, or (probably least of all) school cafeterias-in short, from any place that doesn't have a full-scale pizza kitchen with trained chefs. Such facilities have had to make due with frozen product that, yes, approximates cardboard splashed with some tomato sauce and cheese. But old-school culinary skill combined with modern technology is now making traditional hand-tossed New York-style pizza available to all such facilities-and in ten minutes, from the package to the consumer's mouth, a little longer if extra toppings are added by the facility. One might believe that only horribly bland frozen pizza can yield that kind of ease and speed, and this is true. But what if a manufacturer dedicated to old-school values found a way to bring a never-before-seen level of care and expertise to frozen pizza? Surprise, it's happening. 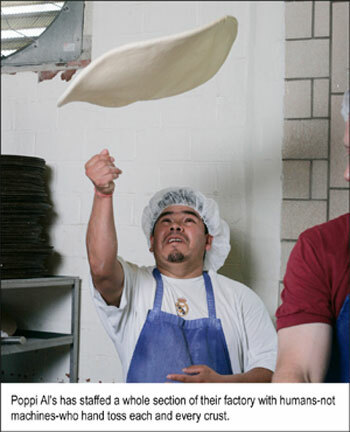 One pizza-maker has staffed their factory with humans-not machines - who hand toss each and every crust. This maker utilizes a proprietary secret proofing method (proofing is the process of allowing the dough to rise) that would never be attempted by giant frozen pizza companies; and, they use only fresh ingredients. The end product is then flash-frozen to preserve freshness, and is, according to numerous pizza aficionados, something very close to the real deal. The name of this unique manufacturer is Poppi Al's, a independent operation now bringing the pride, secrets and last but not least taste of hand-tossed and fine ingredients to the big wide world of frozen pizza. Compare their methods to the normal run-of-the mill frozen pizza maker, who mixes the dough in enormous batches, then runs it through a feeder, producing giant sheets. From these sheets "pizza shapes" are machine-cut, and to these "shapes" are applied low-quality preservative-laden ingredients. This process is the cause of that special "frozen pizza" taste which has become so widely known. Yes, labor and production costs are greatly reduced - but so is the flavor. one may be aware of, including several higher-end hotel and music club chains, recurring benefit events, golf tournaments, and numerous theme parks. And it "keeps 'em coming back" - at one amusement park, thousands of customers keep returning for the pizza - and oh, yeah, the rides. It's the kind of offering that causes many consumers to regularly frequent a particular bar or other eating establishment . Because of this, a number of large food service distributors have gotten wise and carry the product for concessions, bowling allies, ball parks, schools and other outlets whose customers, over the last few years, have developed discriminating tastes. The manufacturer even packages it especially for distributors' large-scale storage in packages of 12-18 pizzas. Such a product allows a distributor to offer unique and special taste to customers without added cost, which in turn allows their customers to economically offer a tasty product to end-users and consistently retain their business. There are, of course, numerous reasons why frozen food giants have not embraced such old-school methods. They require stocking special ingredients such as real mozzarella, cheddar and Romano cheeses and fresh garlic, tomato puree and vegetables. They demand the allocation of hand-tossing stations. Extra time must be allowed for the proofing process. And most importantly, employees must be trained in the time-honored traditions of hand-tossing. But this clever company has developed a formula that allows them the necessary labor expenditures without passing them along on the sales ticket - the gist of which is that they do not have expensively burdensome middle and upper management tiers. Their management is lower in cost, which balances out the higher labor cost. There are 4 different pizzas currently available, all with hand-tossed crusts. The Traditional Cheese Pizza, their most popular, is topped with California tomatoes marinated with a special blend of herbs and spices, uses 100% real mozzarella, White Vermont cheddar and Romano cheeses, and can be topped with pepperoni or vegetables. The Gourmet White Pizza with Garlic is topped with a delicious combination of creamy white garlic sauce and three genuine cheeses, and is great served alone or topped with shrimp, crabmeat, asparagus or other vegetables. Also available are The Veggie Pizza with Garlic and The Southwestern Vegetarian. All pizzas are available in 7, 9, 12, and 16 inch sizes. Since many aficionados have a firm belief that a pizza is made or broken in its crust, Poppi Al's also provides its famous hand-tossed pizza crusts alone, which many establishments use as a base for their own gourmet creations. For the first time ever, real New York-style pizza can be had at the ball park, the school, the bar and yes-even the bowling alley. For more information about Poppi Al's hand spun gourmet crusts, visit www.poppials.com or call 1-800-296-6263.